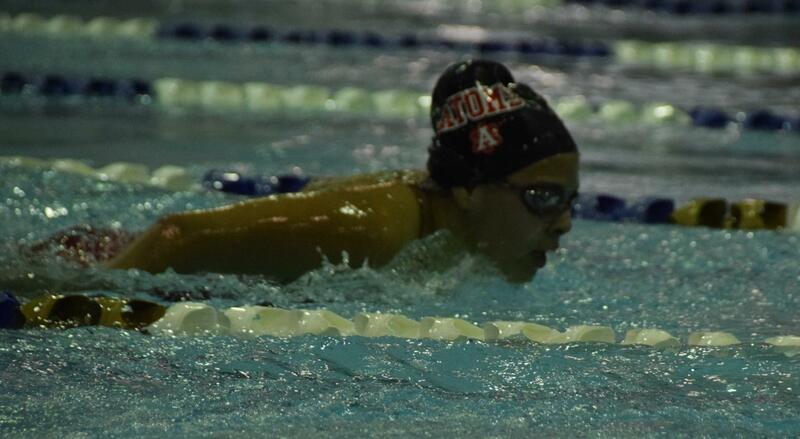 Junior Umi Herman swims butterfly during a past meet. On Jan. 25 and 26, the boys and girls varsity swim and dive teams went to Gunston District meet at Lee District Park. The girls finished the Gunston District Championship coming in fourth place out of five teams with a score of 304. In addition, the Girls 400 m Freestyle Relay team finished in 3rd place. Sophomore Madison Cruz finished in 3rd place in the 100 m breaststroke. Senior Megan Lee took 3rd place in the 200 m.
The boys finished the tournament in last place with a score of 224 coming close to Mt. Vernon, who scored 232. The swimmers looked to work harder in practices in preparation for districts. The swim teams appeared to struggle in their regular season with both teams having a record of 1-6. In their last meet against T.C. Williams, the boys lost 199 to 98 and the girls lost 178 to 131. Both were only able to come away victorious against Mt. Vernon, the boys winning 145 to 141 and the girls 200 to 103. Although the season did not go as originally planned, many swimmers improved throughout the season and reached their personal goals. The season also made new bonds between the swimmers. Douglas believes that the teams have learned new things throughout the season, and worked hard to be where they are. “They worked hard on conditioning and learning how to swim with drag, wearing extra layers, during practices. Also, they took the smaller lessons that they learned each week from practice or the meet and applied them to the following week,” Douglas said. The players also reflected on their season.